This guide will help you making your first voice call. 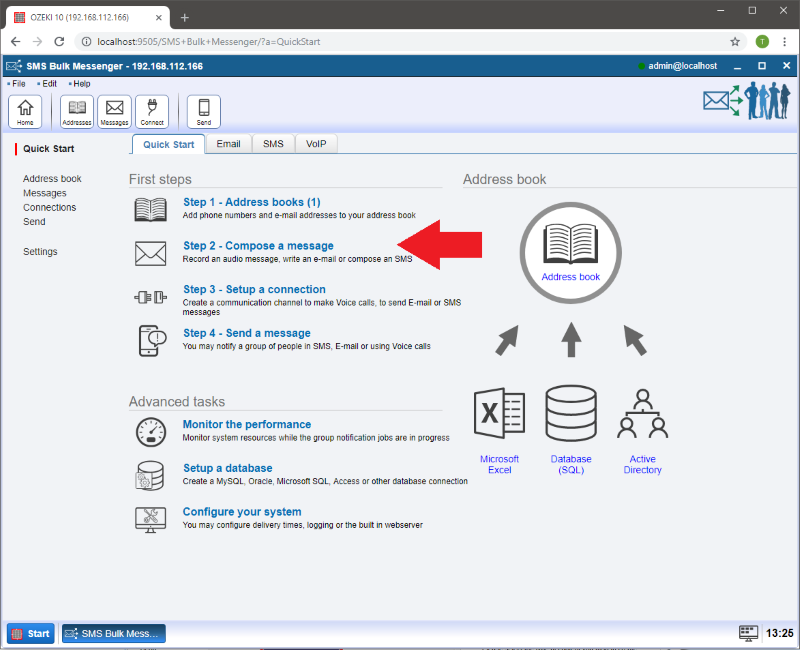 You can make voice calls using several types of address books and with a massive amount of messages. On the main page you have to select 'Step 1 - Make an address book' (Figure 1). 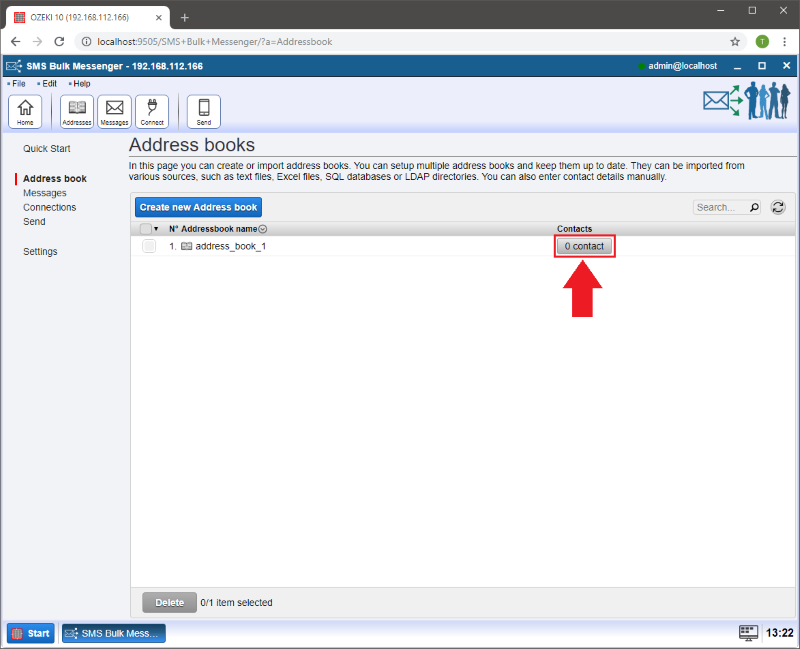 Then you can choose from many addressbook types which can be found in the 'Address book details' window to the right. In this case we have selected the 'Standard' type addressbook. 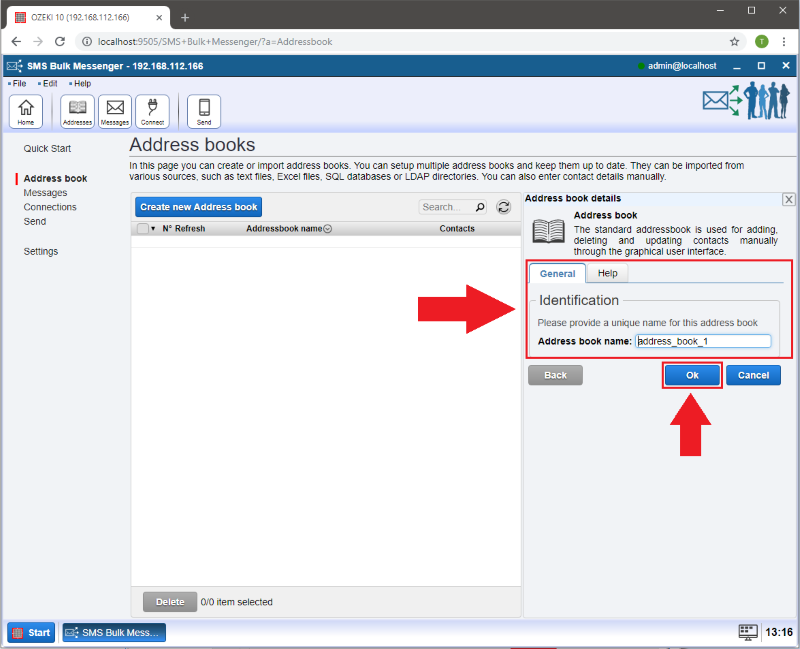 In the 'Identification' field you can provide a name for the created addressbook. 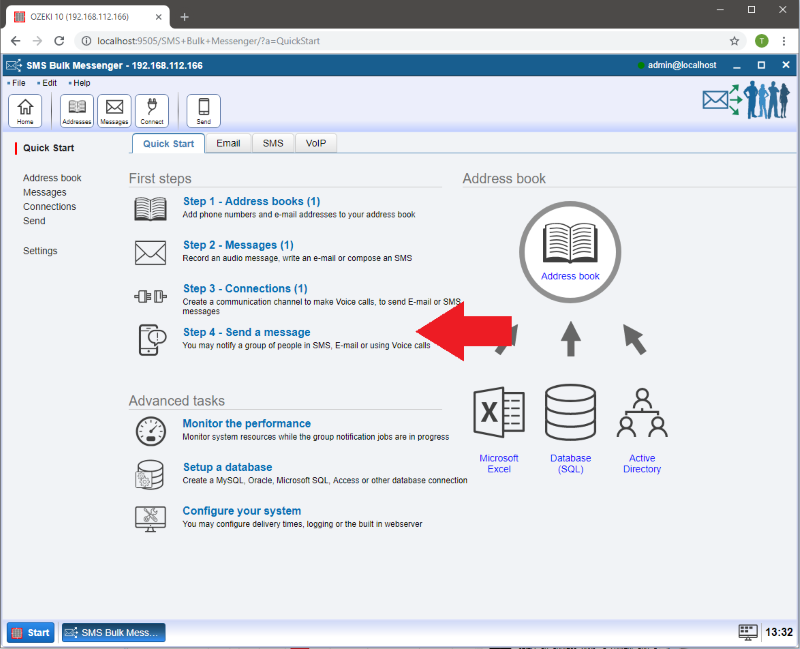 As we use a Standard addressbook we have to add the contacts to the addressbook manually. 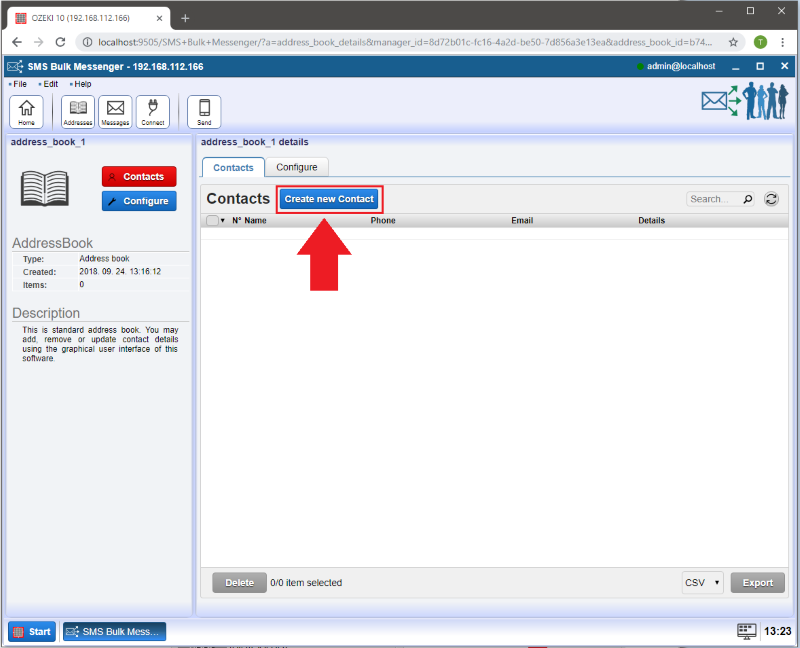 To do this, you have to click on the 'Contacts' button after the addressbook has appeared on the list. 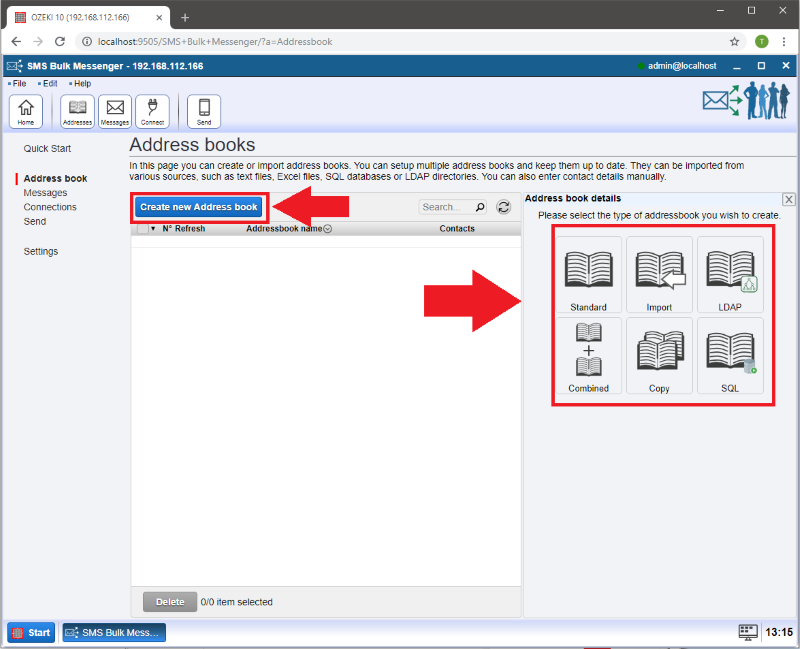 This is where you can provide detailed information about the contact you wish to add to your addressbook. After clicking 'Ok' your contact is added to the contact list. 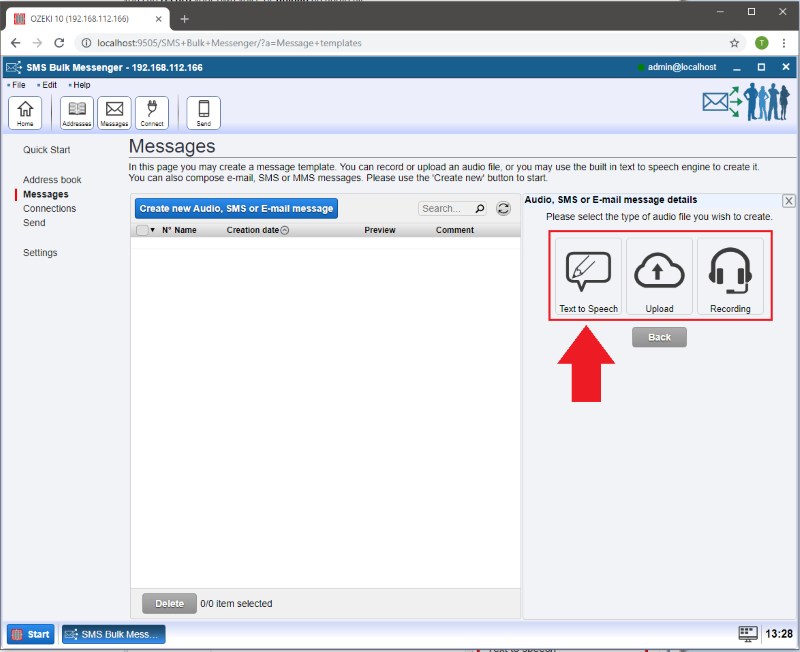 On the new page you have to select 'Create new Audio, SMS or E-mail message'. 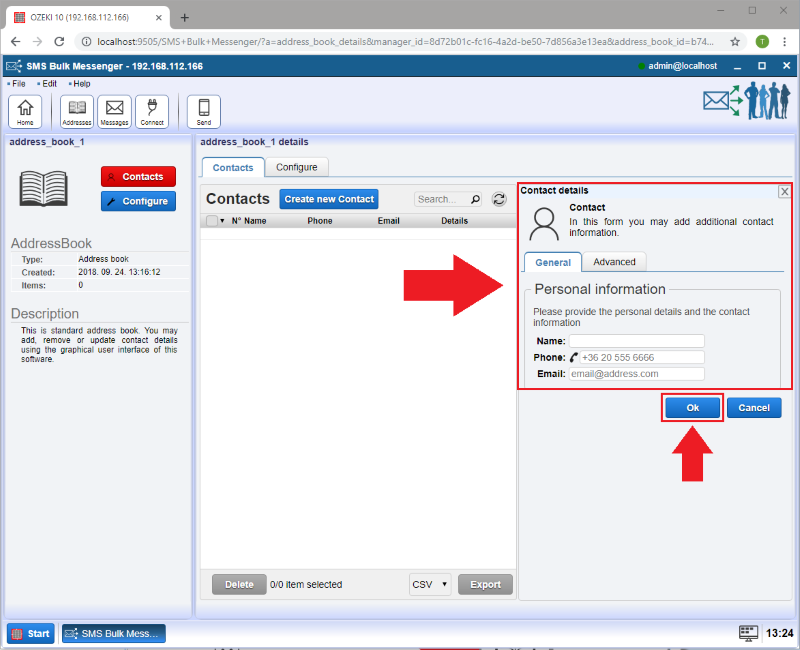 To create your first voice call click on the 'Audio' message type (Figure 8). 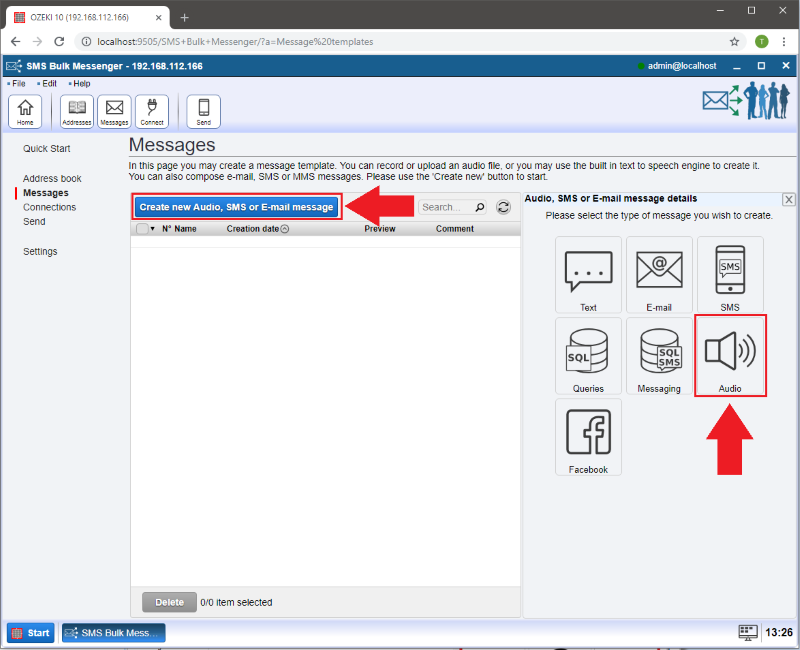 If you select the 'Text to speech' option (Figure 9) then you can easily send automated voice messages. Besides text to speech, you can record your own voice or upload an audio file. 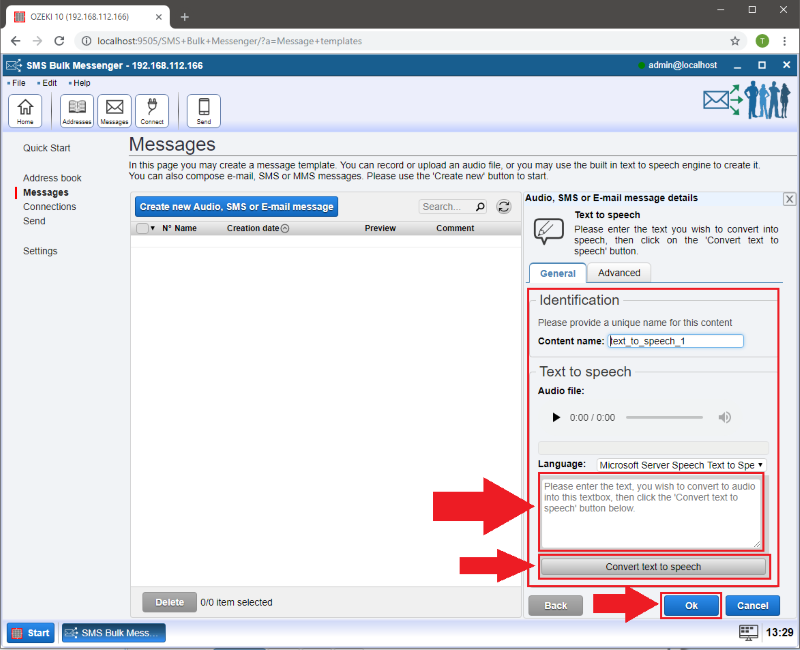 If you have selected text to speech, please type the message in the required area and click on the 'Convert text to speech' button then press OK(Figure 10). 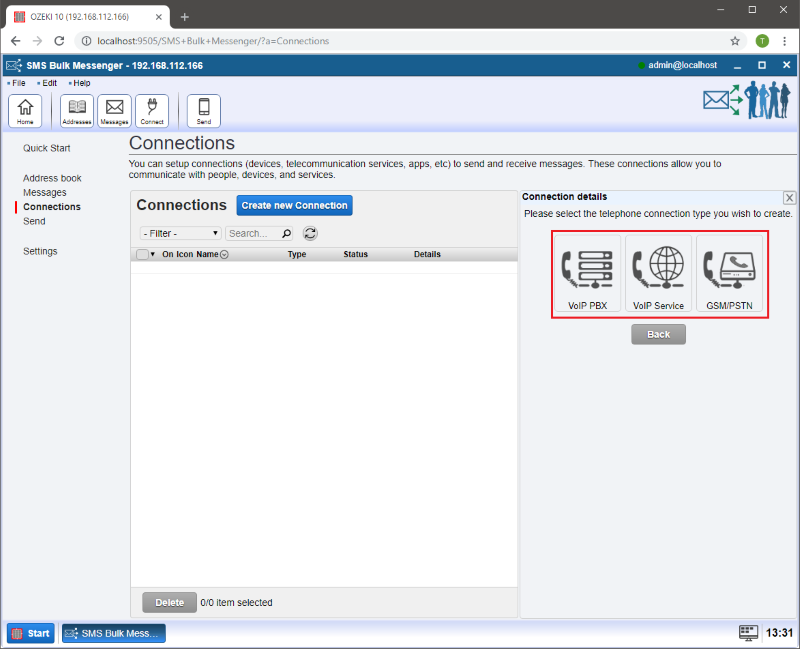 At this step you have to select 'Step 3 - Setup a connection'. (Figure 11). 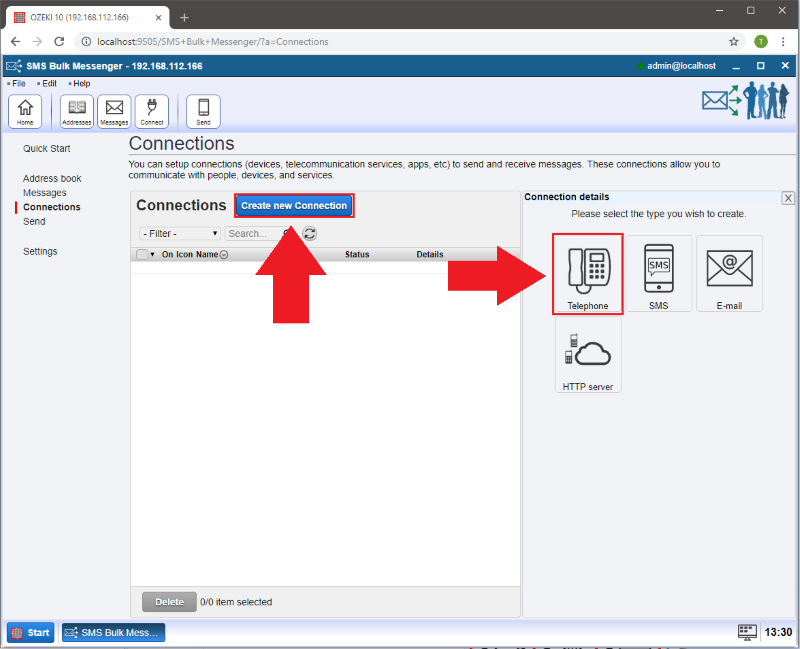 On the new page click on 'Create new Connection' and after that select the 'Telephone' connection for your voice call (Figure 12). How to install different types of connections. 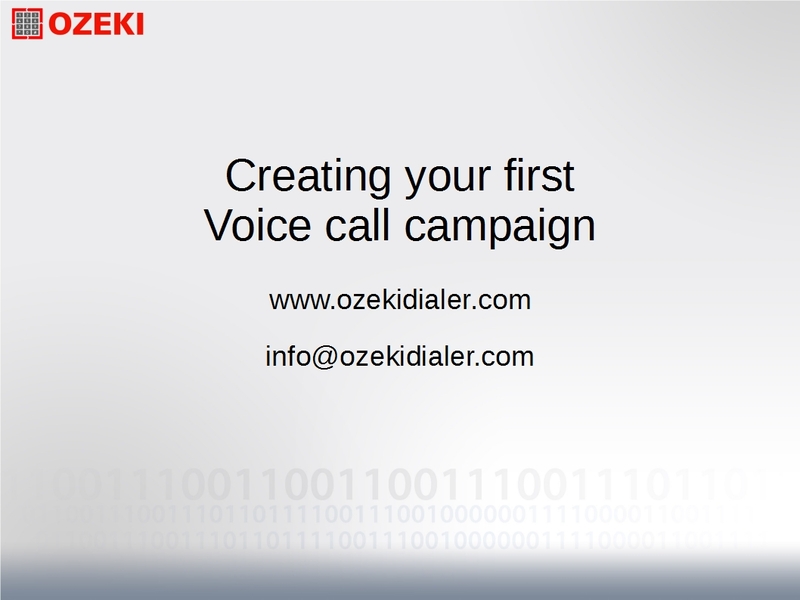 This is the final section to make a successful voice call with Ozeki Bulk Messenger. 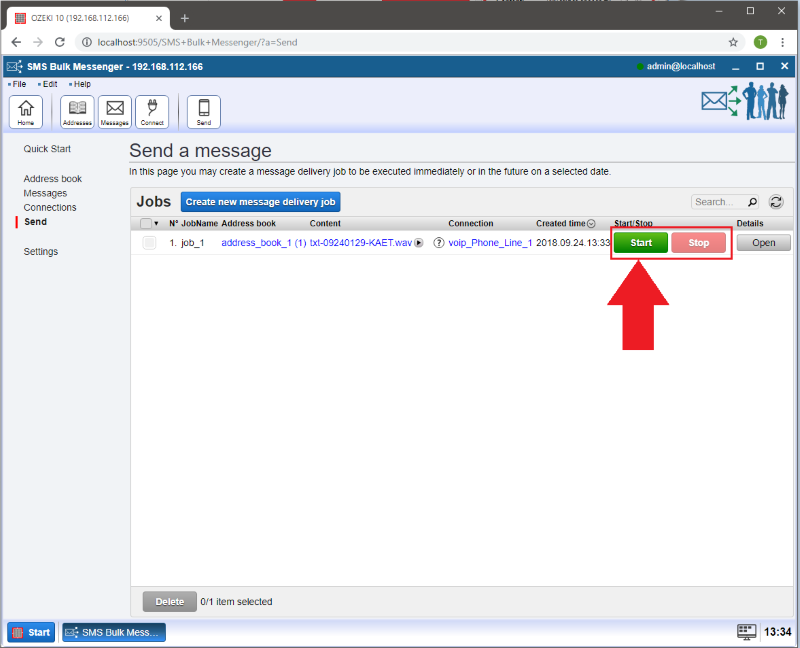 Select 'Step 4 - Send a message' to deliver your message (Figure 14). 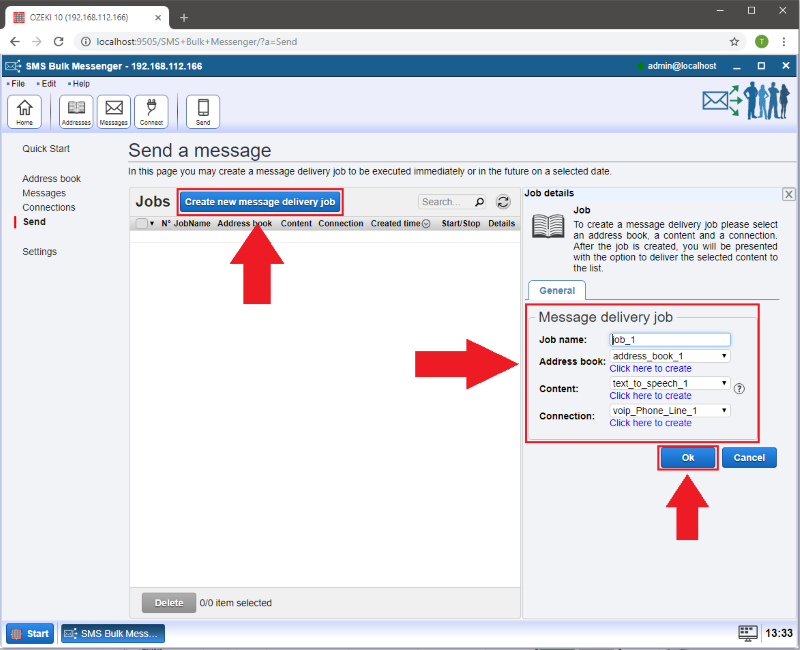 Click on the 'Create new message delivery job' button. 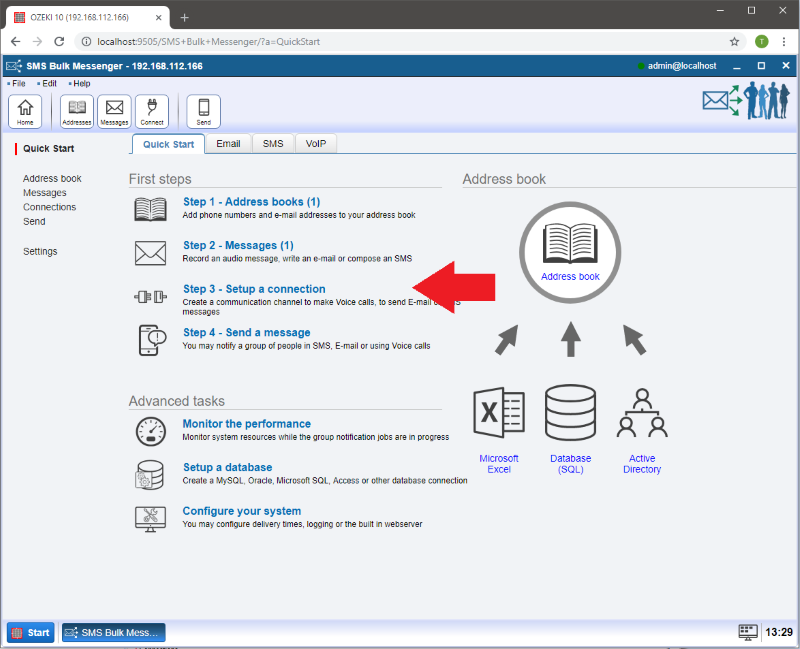 At the right side you can select the suitable address book, message and connection(Figure 15). After you have created the job, it will appear in the list. If you want to start your delivery you have to hit the green 'Start' button (Figure 16). After the delivery job is finished, you can see the result of the job: the rate of completed or failed calls (Figure 16).